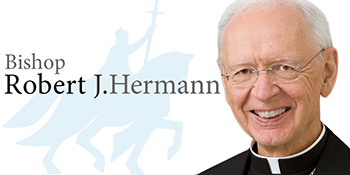 Bishop Robert J. Hermann is auxiilary bishop emeritus of St. Louis. We know that once Adam and Eve sinned, the gates of heaven were closed to all mankind. All mankind was, in a sense, serving a sentence of imprisonment in sin. Imagine serving a life sentence of imprisonment and suddenly you’re told you’ll be let out of prison. Most would want to run to that person who gave the word and thank him or her. That word came in baptism, and it came from one no less than Jesus Himself. That moves me to want to spend quality time contemplating the difference between hell — exclusion from God for all eternity — and heaven — unity with the Father, Jesus, Mary and all the angels and saints for eternity. I’ll spend quality time prayerfully thanking Jesus for giving me the hope of living a life of eternal glory. In different ways, all three readings tell us this for the Feast of the Baptism of the Lord. In the first reading, God prompts a group of people to shout out to His people words of comfort and hope. God has expiated Israel’s guilt, and Israel has received from God double for all her sins. Israel stands for all of God’s people. When God speaks, His power goes forth to accomplish His wish. What might this shepherd feed His flock? Our deepest hunger and longing is for God’s mercy and the hope it brings. Even though we may not see this clearly, God offers us what our hearts most long for, life in eternal glory with Him. God takes the initiative, not only in telling us what is the deepest longing of our hearts, but also making the fulfillment of that longing possible. The readings joyfully shout this to us on the Feast of the Baptism of Our Lord. In the second reading, Paul speaks in a gentle and loving voice telling us: “The grace of God has appeared, saving all and training us to reject godless ways and worldly desires and to live temperately, justly and devoutly in this age, as we await the blessed hope, the appearance of the glory of our great God and savior Jesus Christ …” In other words, the power of God is saving us by training us to live a virtuous life. The Father is well pleased in His Son because He knows that His Son will sacrifice Himself on Calvary to take away mankind’s sins. Life imprisonment is over for all who choose to come out and follow Jesus. Jesus makes it possible for mankind to come out of prison; in addition, He and the Father will send the Holy Spirit to dwell in believers and give them a longing for virtue, a longing to please God, and a desire to live in such a way that others are captivated by their virtue and want also to be filled by the Holy Spirit. Our baptism is the greatest thing that has ever happened to us. We would do well to spend quality time daily in prayer and in reflecting on Scripture so that we can come to a fuller appreciation of the glory that is coming our way if we are faithful.